Some five years ago I visited the Republic of Cyprus. Spent a few days driving around the coastline from Pafos to Larnaca, rambling and climbing the Trodos Mountains. I tried to visit some local Amateur Radio operators, but none of them was willing to show me the antennas nor radio installations. I guess the people living in the south of Cyprus are fed up with tourists and visitors. The tourist agents and car rental companies warned me about going to the North of the island. The North is a forbidden, occupied, no-go zone – that's what I heard. Later, I found out that it is not true, and at least a million tourists a year visit this part of Cyprus. Generally, I do not trust the main stream media and never been politically correct. I ceased reading travel magazines long time ago, when I could afford my first journey as a tourist and confronted the reality with falsified stories. I prefer to see things for myself and shape my own, eyewitness-based opinions and draw conclusions. One November day this year, when the temperature was around freezing point in my home town, I decided to visit the Turkish Republic of North Cyprus. This republic is not recognised by any other country of the world but Turkey, and consequently no direct flights from other countries are allowed. We had to land in Antalya, Turkey and an hour later lifted off again to fly the short distance to Ercan airport, several kilometres east of the capital of Cyprus, which is called both Lefkosa and Nicosia. There is another large airport west of the capital, now defunct, in the disputed zone between the North and the South. As usual, I tried to contact local Amateur Radio operators. The 1B prefix used in Northern Cyprus is not officially assigned. There are approximately fifteen licensed operators, living chiefly in Lefkosa area. The total population in the North is estimated to be around 300 000, so the Amateur Radio density factor is not outstanding. There is some potential for growth, particularly at the nine universities in the region. If radio clubs were set up at some of them, we would see here many more enthusiasts of our hobby. Competition with the Internet and digital communication is tough, but I still believe that many young people would love to get involved in Amateur Radio and what it offers. I met two Turkish Cypriot hams, whom I would like to present here. They received their permits and call signs in the '90s, and today both are retired. Mustafa, 1B1AD, lives in a small house in the northern part of Lefkosa and has a tribander visible from the main road. His radio room is packed with mostly aged electronic equipment and a few radio transmitters and transceivers. Amateur radio gear is not available locally and has to be privately imported. The Cushcraft A3S antenna was acquired from a British amateur. Mustafa is not very active these day due to health issues, but he does get on the air occasionally using digital modes. He was a physics teacher and is interested in all electronics, not only radio. Mustafa speaks fluent English and is open-minded. He phoned his neighbour Ismail, 1B1AH and asked him to come over and guide me to his home. Mustafa, 1B1AD, in Lefkosa, Northern Cyprus. 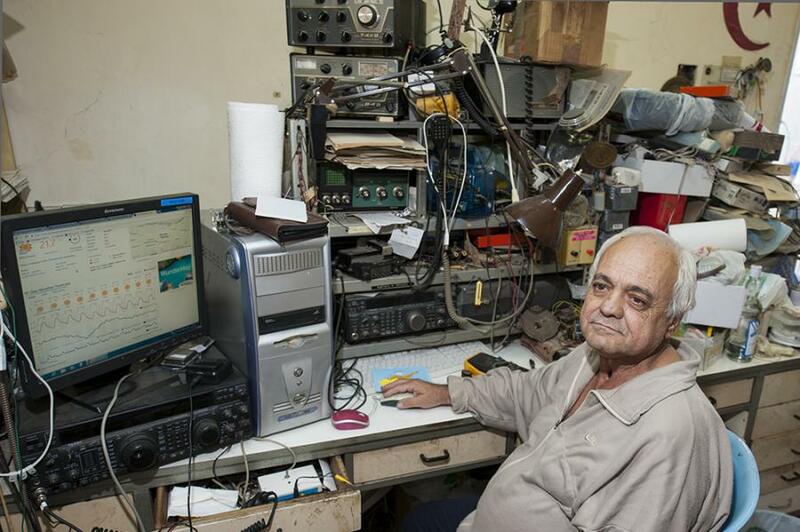 His radio shack is a collection of old and new. 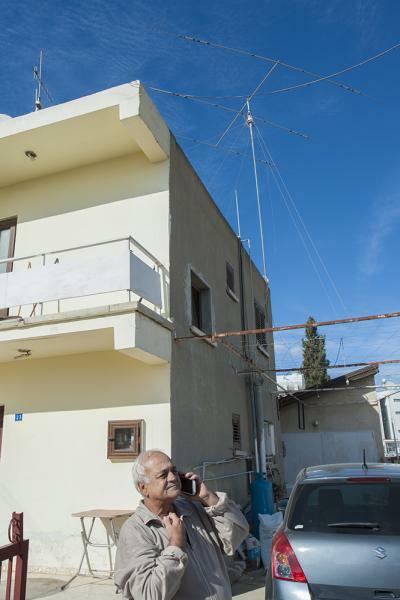 Mustafa, 1B1AD, in front of his house with a tribander for HF bands. Ismail, 1B1AH, is also in his sixties and received the radio permit in the late '90s. He speaks some English and in spite of being a retired arts teacher, his true passion is electronics. 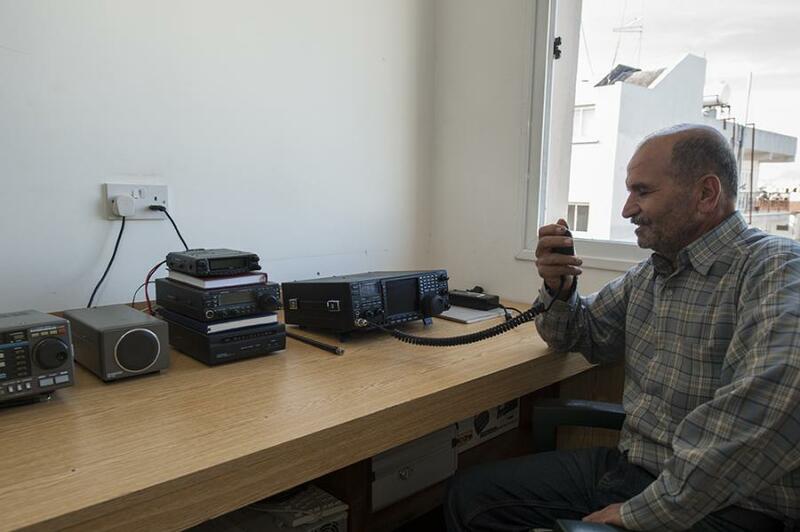 Ismail has a modern station, a neat set-up on the desk, but the condominium he lives in does not allow large antennas on the roof, so the multi-band radiator is a G5RV dipole strung between two apartment blocks. He is mostly active on lower bands and prefers local contacts. However, Ismail is an ardent constructor and experimenter. I was shown a number of completed electronic projects, including receivers and low-power transmitters, as well as many components stored in good order. Truly impressive. Ismail, 1B1AH, in his tidy radio room. The G5RV dipole is visible outside the window. Ismail, 1B1AH, has built a number of receivers and low-power transmitters. My overall impression from Northern Cyprus is mostly positive. It is not crowded, not overexploited. The people seem to be industrious and honest. You won't see men sitting in front of cafés all day long as it is customary in the Middle East and North Africa. It is a Muslim country, but not strict. There are some traces of ancient civilisations, historical buildings and the landscape is diversified. The beaches in the North are said to be better than those in the South. The road traffic is not excessive and overseen by plenty of automatic speed cameras. I managed to drive nearly 1000 km without a single speeding ticket. The climate is dry, actually too dry for a sustainable economy and large amount of drinking water is presently imported from mainland Turkey through an undersea pipeline. The Turkish Republic of Northern Cyprus is not on any official "countries list" used by most of ham radio operators. I do not care about any "official" lists because they are often political and lack common sense. For example, a part of a small skerry called Märket near the coast of Sweden belongs to the Åland Islands region of Finland. In the past, this part of Märket was under the supervision of the maritime authority of Finland and was given a status of a "country". Today, this part of the rock is under the administration of Åland's local government, yet still it counts as a separate "country", or "entity". I could name a few other similar nonsense rulings. Many years ago, an editor of a private Amateur Radio magazine from New York divided the world into 40 zones. Still today, these zones are considered to be "official". The idea of Amateur Radio is supposed to be free from politics, religions and commercial interests. I reject all such activities on our frequencies. Never support any "special event" stations or actions that involve such announcements. Since radio waves do not comply with the borders, faiths and social systems, we must refrain from all kinds of propaganda to avoid unnecessary conflicts and hard feelings. The initial aim of Amateur Radio was self-education and friendship on voluntary basis. Many of present-day operators do a lot of harm to the original idea and to our global community. In case of Northern Cyprus, the transmissions of local ham operators are being jammed by "political opponents" from neighbouring countries. I do not approve of the North Korea regime, but would never waste my time and electricity on jamming any transmission from P5. Use brains, you people making deliberate QRM just because you do not like a DXpedition, your mother-in-law or anything else. The island of Cyprus is today divided into four (4) control areas. The whole island is considered to be the Republic of Cyprus. However, there are two large British military bases, which count as a "country", and even the highest point of the island, where a long range radar is located, is protected by British troops. The buffer zone along the "green line", dividing the island, is under supervision of the United Nations forces. The Northern Cyprus is reinforced by the Turkish army, while the southern part relies on its Cypriot National Guard. An average European citizen is not interested in understanding the origin of such conflicts as this one in Cyprus. People on other continents do not care at all. The main stream media will not highlight the background, they serve final conclusions and opinions. These are the facts: Cyprus became independent in 1960 and the majority of inhabitants were of Greek ethnicity. In 1974 the Greek military junta overthrew the legal government of Republic of Cyprus and attempted to take over the whole island in order to incorporate it into Greece. The Turkish Cypriot minority reacted in self-defence and with the support of Turkey eventually created, in 1983, the Turkish Republic of Northern Cyprus. The international community condemned this action and will not recognise this country. I think the international community should have reacted in the year 1570 when the Ottoman Turks conquered Cyprus. Doing it 400 years later was rather late. A word of warning to our politicians in Brussels, Berlin and Stockholm: if you do not want to see bloody ethnic conflicts in the near future, don't let large groups of people of dissimilar culture and religion stream into your countries. Study the history of human kind before it is too late. A present day conflict in Eastern Ukraine is a carbon copy of the Cyprus bloodshed 40 years ago. Ethnic Russians living in Ukraine did not like the idea of joining NATO and the European Union, so they asked Russia for assistance. Nice informative article covering the area. I think that the article covered radio amateurs living on north part of island without any political propaganda. I disagree with the comments made by SY1BFI and SV5DKL. Greek friends, please do not feel offended just because it's covered in this website. It's a reality and there are amateur radio operators living in north side. The author did a good job explaining radio waves do not have borders and we, amateurs, need to forget about all the politics and conflicts. The article has nothing to do with politics but a simple reality. Let's be nice and be citizens of the world without borders. All the best from Eire. The idea of Amateur Radio is supposed to be free from politics, religions and commercial interests. Then proceeds to write cheap infantile political propaganda, including defending Russian occupation of neighboring countries that Stalin would be proud of. Why are you publishing this garbage? This is supposed to be a respectable dx news site.